At Elokenz we are sold on the idea of writing evergreen content and reposting it to reach more readers. And our users are too! There are only advantages in recycling your older content, here are a few reasons why you should start today. If you have a growing business, you might have new followers everyday. They might have decided to follow you because they liked that one article they just read or maybe you were recommended to them because of the topics you write about. People usually follow you on social media because they are interested in what you have to say and they want to get updates on your next blog posts. But what about the hundreds of articles you wrote before they subscribed? Pamela Vaughan, Marketing Manager for HubSpot. Recycling your older articles will get them to see twice more content they like and to read articles they wouldn’t have found otherwise, instead of just getting updates about your last articles. Because Twitter is a real-time platform and your readers are most probably following several accounts, you have to make them notice your content. Studies show that you reach more people by sharing your post with an image. But that’s not always enough to stand out and your tweet can definitely not be seen by all your readers by posting it only once. Too many times we make the mistake of publishing content, promoting it, and moving on from it forever. But in many cases that content still has a lot of juice left to squeeze in it. Resharing older content can put it in front of a whole new set of eyeballs, which can drive more traffic, encourage more shares, and even attact more backlinks — all of which can be beneficial for your SEO and online marketing efforts. There is one thing you should keep in mind when doing this. Make sure the information in the old content is still accurate and up to date. In fact, you may even want to give the page some light updates to make it more current and to further justify its relevance. It can be the same for Facebook and Linkedin, if your followers didn’t enable notifications to see your latest posts, they might miss them. 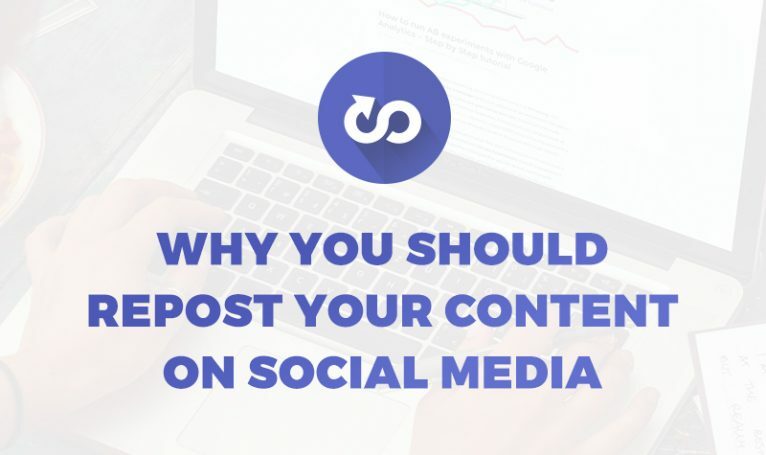 That is why reposting your content several times (at a different frequency according to the platform chosen) will increase your reach and get more people to visit your blog. Recycling your old content isn’t only about sharing the same status every now and then. It is also about getting your audience excited about what you wrote. If they didn’t feel like reading it the first time you shared it, it might be because you didn’t introduce it well enough. I love republishing old content! Most of my best evergreen content are deep in my archives, and reposting them gives me an opportunity to provide immense value to new readers and engage them without much effort from me. This is a good opportunity to get in front of my audience without having to constantly create new content. This way not only you will reach new readers but your current audience won’t feel like you are spamming them with the same old post over and over again. You might even increase the chance for them to share your content with their own audience. Republishing old content generates new links and reaches a fresh audience, some of whom will be your perfect prospects. It gives you deep links and it doesn’y matter if these are Do-follow or not. Links means visits by real people, who you then have a chance to impress with your knowledge or offers. Every piece of content you create should have multiple lives. Keep your content working hard for you by repurposing it in [these] creative ways. Reposting your evergreen articles helps you keep your content fresh. Having an evergreen content posting schedule gives you an overview of all your content. Doing this, you can check if an article should be updated and it can also be a great way to spot articles that can be repurposed to create even more evergreen content! Not everyone gets to read your post the first time around. As interaction varies by niche and demographics, it helps to republish older content to ensure everyone can benefit from your very best work. Furthermore, you can (and should) add small updates that resonates more with current times, even when publishing evergreen content. A great advantage of recycling your old content is how much time it saves you. Finding what to post next can be a real head-scratcher sometimes, but by reposting your evergreen content, you will always have something to post on your social media accounts. No more calendar slots left empty, you always have an older piece of content that is worth reposting. You can save even more time by automating this process with a tool such as Repost by Elokenz. Taking care of your articles will motivate you to spend more time writing evergreen content. You will see that time spent on well written articles is worth it because of the traffic it will bring you, not only now but on the long run too. You will enjoy writing evergreen articles, even if you spend more time on it, because they will last longer, bring you more traffic and your readers will appreciate those pieces even more. If you don’t take care of your content, who will? You spend time, energy and money on blogging about topics you like to grow your business. There are only advantages in taking care of your content and the process can be seamless with evergreen content automating tools. So don’t let your content collect dust, recycle it by reposting it. We are currently preparing an article about Social Media Tools to automate Content Distribution. Follow us on Twitter and Facebook to have updates!